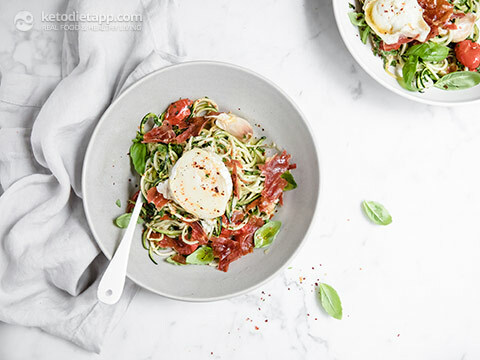 Zucchini noodles aka zoodles are a great keto-friendly alternative to pasta and an easy way to get more vegetables into your diet. Cook zucchini noodles for too long though and they go mushy. 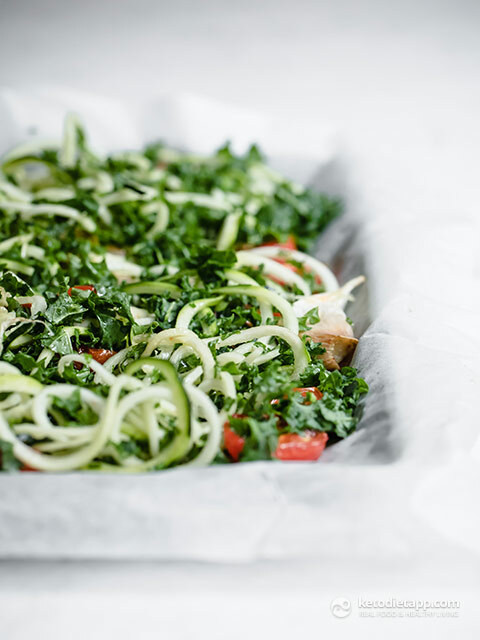 What I love about this low carb recipe is that the vegetable noodles are cooked as part of a one pot, tray bake and tossed in the slow roasted garlic and tomato juices so they’re so super tasty. Have you made prosciutto crisps before? 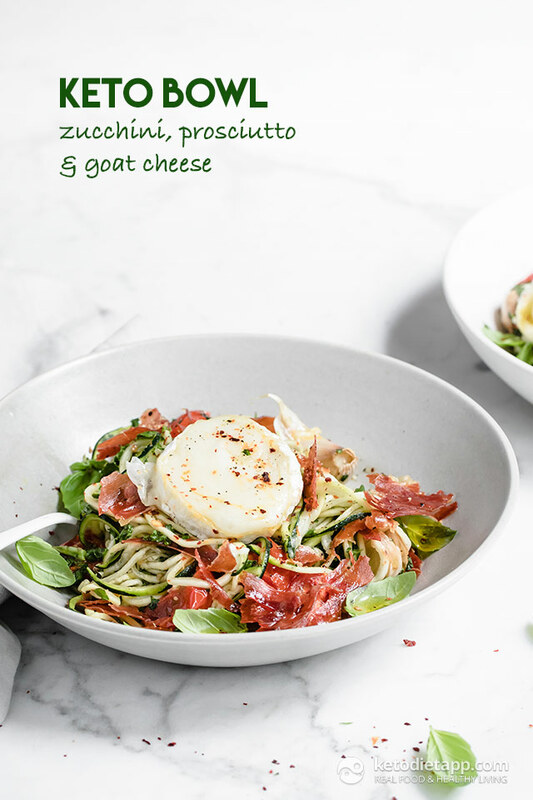 They’re the perfect salty complement to this healthy dinner and topped with goats cheese. Baked so it’s all warm and gooey. If you want to add more healthy fats, simply drizzle with two more tablespoons of olive oil to serve. Be ready guys, your taste buds are going to tango with this dish! I’m in love with it and I make a variation of it most weeks. Let me know what you think in the comments below. Preheat the oven to 180 °C/ 355 °F (fan assisted). Line a baking tray with grease proof paper. 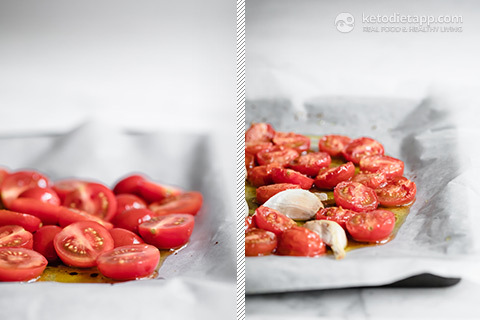 Add the tomatoes, olive oil, balsamic, salt and pepper. Roast for 25 minutes. Add the garlic and roast for a further 8 – 10 minutes until soft. Line a clean baking tray with greaseproof paper. 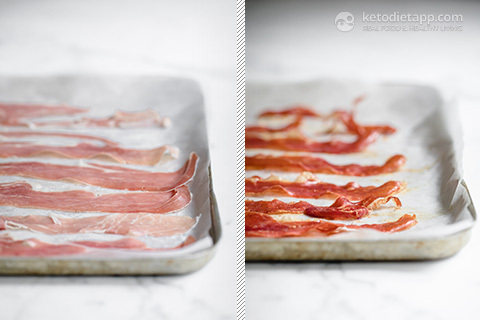 Add the prosciutto slices and bake in the oven for 5 – 7 minutes until crisp. Turn halfway for even cooking. Once cooked, remove from the oven and allow to cool. 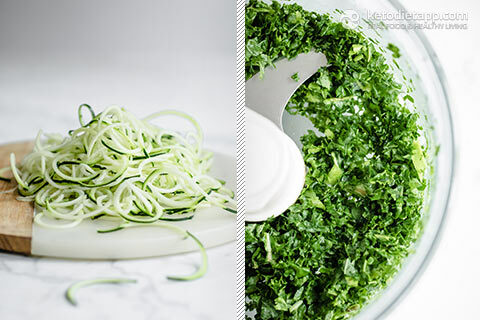 Make the zucchini noodles using a spiralizer or julienne peeler. Shred the kale in a food processor or finely slice. Meanwhile slice the goat’s cheese. Place on a clean greaseproof lined roasting tray and bake for 5 – 7 minutes until the cheese starts to melt. Add the zucchini noodles, kale and half the basil to the roast tomatoes and gently toss. Roast in the oven for 3 minutes to warm through. Break the prosciutto slices into smaller pieces. 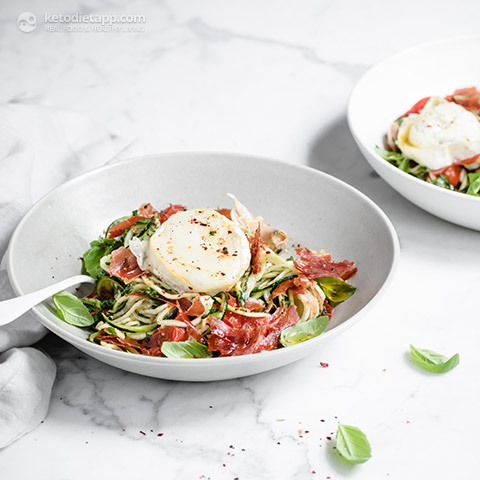 Place the noodles in a bowl and top with prosciutto crisps, baked goats cheese, remaining basil and a sprinkling of cracked black pepper. Best when served fresh but can be stored in the fridge for 1 day.